There is nothing like the excitement of a holiday road trip. Whether you are heading off to Grandma’s house for a delicious holiday feast or just getting away from work for a few days, embarking on a family road trip is a great way to bond with your loved ones and share the fun of the open road. As the day of the long awaited holiday road trip nears, you are filled with anticipation, planning your daily activities, calling your loved ones on the other end and getting ready to have a great time. But in with all that fun and anticipation, it is important to pack safety. Driving in unfamiliar surroundings, fatigue from long hours on the road and the ever present threat of bad weather can really take their toll. If you want to arrive at your destination safely, you need to plan ahead and think about ways to prevent accidents. If you want your next holiday road trip to be a safe one, you need to take some proactive steps. Safety does not happen by accident, and the steps you take now could prevent a lot of heartache later. You do not have to spend a fortune, or even a lot of time, on your pre-trip safety checklist. With a few common sense precautions and some proper planning, you can enjoy a safe holiday road trip you, and your family, will remember for a lifetime. Your once a year vehicle inspection is not enough to protect you during a holiday road trip. Even if your mechanic blessed your car at the last inspection, it is important to have it rechecked before you leave for your holiday road trip. Ask your mechanic to check the belts and hoses, top off the fluids and make sure your tires have enough tread to make the journey. Top off the service with a new set of wiper blades, an essential safety tool in a summer thunderstorm or winter snowfall. Before you leave the driveway for your holiday road trip, make sure you know where you are going and how long it should take to get there. Check the road conditions along the way, and plan for unexpected delays due to inclement weather and road construction. You can find information about road conditions and weather forecasts right on your smartphone – just download the apps before you leave home and make sure you know how to use them. Technology can help you stay safe behind the wheel, so take advantage of it. Even if you know where you are going and how you plan to get there, it is important to map out your daily driving. Take a look at the total mileage, think about how long you can safely drive each day and plan your route accordingly. It is better to spend a little longer on the road by driving safely than to hurry and possibly get into an accident. You want to arrive at your holiday destination rested and ready to go, not too exhausted to have a good time. Driving in unfamiliar territory can be dangerous even in daylight, but it becomes even riskier after dark. If possible, plan your route to avoid nighttime driving, and driving at dawn and dusk, when changes in light can create glare and dangerous driving conditions. If you must drive at night, be sure you are well rested. Schedule your last pit stop before the nighttime leg of your journey, and stock up on coffee and other caffeinated beverages to keep you awake and alert. If you do feel tired or fatigued, pull over to the side of the road or find a hotel for the night. No matter how much you love to drive, all those miles on the road can leave you feeling sore and fatigued. That is why it is so important to schedule regular rest stops along the way. Sit down with your map or mapping software in hand, plan your daily mileage and look for natural resting places along the way. Whether you stop at a local restaurant, grab a bite at a fast food joint or just park by the side of the road and stretch your legs, these regular road trips can refresh you and make the rest of the journey that much safer. If you are lucky enough to have more than one licensed driver in the car, divvying up the driving duties can make the trip safer for everyone. Talk about who will handle what part of the journey and swap off when you feel tired. If one of the drivers in the car is a new one, make sure they stick to daytime driving, and preferably take the wheel during less challenging parts of the journey. A road trip is a great learning experience, but new drivers tend to be overconfident, and that could lead to an accident. No matter where you drive or when, always be aware of your surroundings. Look at least two or three cars ahead, instead of staring at the bumper in front of you. Take a look around from time to time, watch what other drivers are doing and always be ready to react. Use care when driving through unfamiliar town and cities, and let our intuition be your guide. If a neighborhood seems sketchy or unsafe, trust your instincts and find a safer spot to continue your trip. 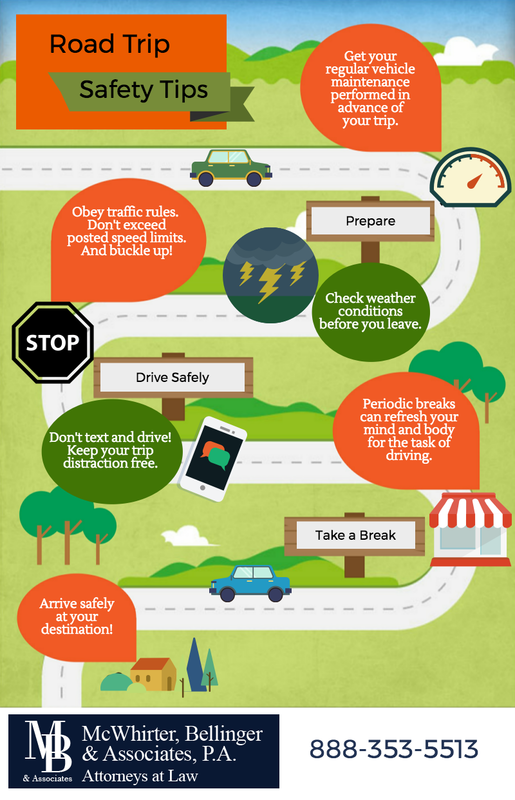 Embarking on a family road trip can be a lot of fun, but safety is always an important consideration. From having your vehicle checked from hood to trunk to paying attention to those around you, there are plenty of things you can do to protect yourself and your family during your long holiday trip. Previous Post: « Do You Know the Most Dangerous Holiday for DUI Auto Accidents?